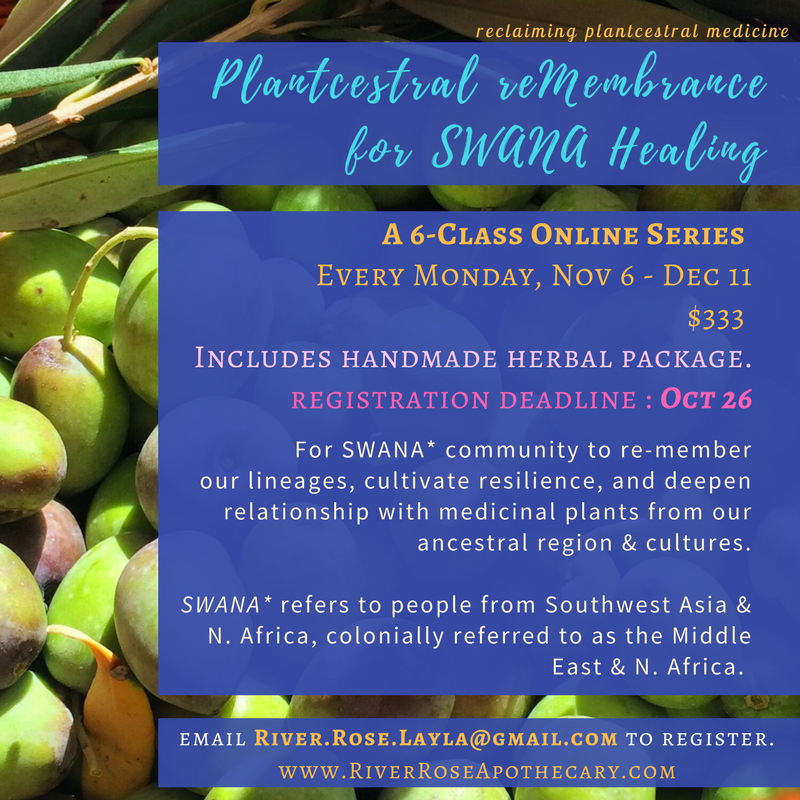 This extended ONLINE series is for SWANA* community to engage in embodied learning about our ancestral plants and their uses as medicinal and spiritual allies. Our ancestral plants carry the DNA of our homelands, of our ancestors, and resonate this memory with the truths that live deep inside our own bodies and hearts. We will work with this relationship to access deeply held wisdom, revitalize lost bodies of knowledge, and re-establish relationship to ourselves, our ancestors, and the resilience and medicine available through being in conscious relationship with our plantcestors. Each participant will receive a package of SWANA native plant medicines to work with through the course of our class together. Experiential relationship with the plantcestors will be emphasized and facilitated through the duration of the class. This season will be focused on deepening resilience through our shared space together and with the plants, as well as on honoring and healing relationship to not only our SWANA ancestors, but to those of the diasporic places we live in and are nourished by daily. - This online class is a small group and is conducted via live video conference calling, and requires LIVE ATTENDANCE and participation each class (must have access to internet/camera or audio & google hangouts to participate- can download for free). Homework will be assigned each week and participants should be prepared to spend a little time (at least 10 mins, ideally 30 mins) each day with the medicines/material in between classes. - A package of medicines will be sent to you via mail for you to work with through the course of our class. - The foundation of this class is based on the cultivation of your own experiential personal relationship with the plantcestral allies we will be working with. This often opens up deeper healing processes. Participants must be willing and available to this process. The group and facilitator are their to support thru each step of the way. If you have any questions about this, please feel free to ask. - Class will meet for 6 Mondays from November 6 - December 11. Time of the class will be determined based on the group's schedule. Answer registration form questions to include your own needs, timezone, and preferences. Please also note if days other than Monday are preferable for you, as nothing is set in stone. Send registration deposit to paypal.me/riverrose (friends and family option, please). *Minimum of 7 participants, maximum of 18. No group will be larger than 9 people each.